Easter may be just around the corner, however for many businesses it marks the start of the dreaded public holiday period. Commencing on Friday 14th April, 2017 (Easter Good Friday), businesses in Queensland will see a total of six public holidays in the next 18 days. Such a phenomenon hasn’t occurred in over a decade, with 2006 being the last time Queensland experienced this concentration of public holidays. While employees may be celebrating, for business owners this means a month of four day working weeks, bringing its own round of challenges to profitability, productivity and staff availability. Fear not, the rest of Australia has not been left without its fair share of public holidays with the nation set to celebrate and commemorate a number of occasions across the coming weeks. *Restricted public holiday in Tasmania, check your Award to see if it applies to your business. While the festivities may cause reason for celebration, the public holidays are set to cost businesses significantly. In Queensland alone, the expected cost of the public holidays is set to blow out to $2 billion dollars. The Chamber of Commerce and Industry Queensland general manager advocacy Kate Whittle, has stated that, “the new Easter Sunday holiday alone would deliver an economic hit of nearly $60 million.” And that’s just in Queensland, with the expected cost for the nation’s public holiday celebrations to be substantial. Tanda surveyed 125 Queensland businesses, to determine their labour decisions for the upcoming Easter long weekend. Of the 125 businesses surveyed it was found that 15.2% of businesses have reduced their roster hours by 100% this weekend compared to last year, suggesting that an increased number have chosen not to open at all. It appears that the effects of Easter Sunday’s new public holiday are already being felt, with 53.6% of surveyed Queensland businesses choosing to decrease their total of hours rostered for the entire Easter weekend. On top of this, of those businesses who opened last Easter Sunday, 11.5% are opting to close their doors this Sunday. So what can businesses be doing to manage the public holiday costs? 1. Cost your roster before the public holidays. Do you know your public holiday rates and when they apply? Do you know your expected trade and how many staff you’ll need to roster on? Building a roster to meet your customer and service demand is the easiest way to optimise your roster costs. Using POS or product quantity data to determine your staff ratios, means that you won’t be over or understaffed for the day. While you’re building your roster, it’s important to keep an eye on the cost of the roster– including the additional penalty rates that come with public holidays. 2. Who’s away or not able to work? Knowing who’s on leave and who’s unavailable ahead of time makes the rostering process a lot easier for everyone involved. It’s also important to keep track of staff leave, as this can affect your labour spend. Full-time and Part-time staff who normally work the weekday the public holiday falls on, are still entitled to be paid for the day even if they didn’t work. 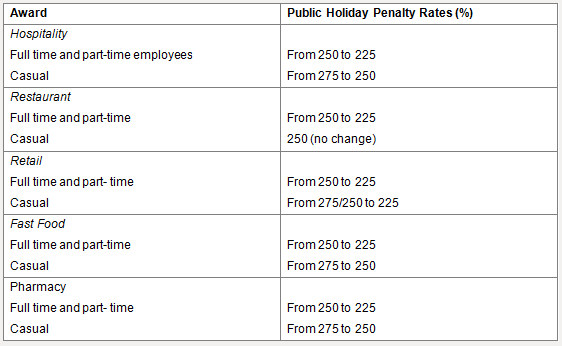 For anyone who does work the public holiday, they’ll need to be paid the public holiday penalty rate. Check your Award to see how this applies to your business. After staff have worked the public holiday, it’s important that they are paid correctly for their hours. This starts with checking staff timesheets on the day if possible, or at the end of the week. This ensures that staff attendance has been recorded and they have been paid the relevant penalty rates for those hours. Doing this before you get to payroll, means that you can catch and rectify any errors early. From here, it’s just a quick export to payroll ready for your pay run. Public holidays can cause concern for businesses owners, so it’s important to know what’s happening and how you can prepare for it. The latest change will see new Public Holiday penalty rates for specific Modern Awards, brought into effect July 1, 2017. Check out the table below to see if your business will be affected.